The end of September marks the beginning of a full week of very popular saint feast days. While it's not very healthy to enjoy dessert every night, there are a few weeks where I make an exception and this is one. For St. Therese of the Child Jesus I always make white cupcakes with roses on top. At least with cupcakes, you can easily share with the neighbors, right? Just a note -- there are many more ways to top a cupcake with roses than by creating them with decorator frosting. If decorating just isn't your thing, try the baking aisle at the grocery store to see if they have candy roses for cake decorating. There is a candy store near my home that carries rose-shaped butter mints -- I think those will top my cupcakes this year. Wilton makes a rose mold for molding melted chocolate, and that's a great option. You can also make roses from fruit roll-ups, so there are lots of options and you are not to be put off by the roses! Line a 12-cup muffin pan and a 6-cup muffin pan with paper liners. In a medium bowl, cream together the shortening and sugar. Finally stir in the milk and beat until batter is smooth. Cool and frost with desired frosting. For the St. Therese cupcakes I used a traditional decorator frosting to frost the cupcakes and then make the roses (clear vanilla is not necessary, just use ordinary vanilla extract -- most of the other ingredients you probably have on-hand). Mid-September brings one of the Marian feasts of an apparition in France. The Blessed Virgin appeared to two young shepherds, Maximin Giraud and Melanie Calvat, on the mountain of La Salette, France on September 19, 1846. 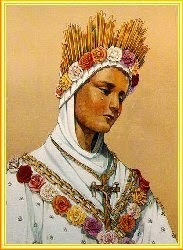 After thorough investigation the Church approved the message and secret of La Salette as written by Melanie. The account was published in Lecce in 1879. 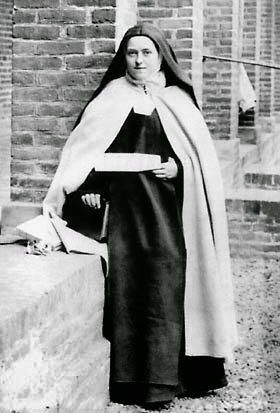 Mary's message in La Salette was similar to that of Fatima, "If my people do not wish to submit themselves, I am forced to let go of the hand of my Son. It is so heavy and weighs me down so much I can no longer keep hold of it." Our lady cried and expressed her sadness at those who do not keep Sunday holy and who take the name of the Lord in vain. I saw the idea for mini blueberry galettes on The Pioneer Woman’s blog. They seemed a perfect dessert for French Marian apparition feast days – galettes because they have a French connection and blueberries because the color is associated with Our Lady. Galette is a French culinary term referring to a variety of flat, round cakes, made with a flaky pastry dough. It is a broad term and can include a wide variety of different desserts, but most often galette refers to a free form tart that is made with a flaky pasty crust. The tarts are not molded in tart pans. Instead, filling is placed directly on top of a circle of rolled pastry and the edges are folded up and around the filling and baked until crisp. In a bowl, mix the flour, sugar, and salt. Cut in half of the butter with pastry blender until the mixture resembles coarse meal. Cut in the remaining butter until the largest pieces are the size of peas. Drizzle the water over the dough and mix until moistened. Knead together 2 or 3 times. Flatten dough into a disk, wrap in plastic and refrigerate for at least 30 minutes. Stir together blueberries, sugar, cornstarch, 1 tsp lemon zest, juice quarter of the lemon, vanilla, and salt in a bowl. Roll out dough. Using a 5-inch round pastry cutter cut rounds of pastry. Rerolling and cutting until dough is used. Makes 6 mini galettes. Place rounds on baking sheets lined with parchment paper. Evenly distribute the blueberry mixture between the six discs. Gently fold over the edges of each crust, folding the dough in on itself to create a small rim of crust. Make an egg wash by beating together the egg and water. Brush edges of each pie with the egg wash. Sprinkle the crust with sugar. Bake for 15 minutes until golden and filling is bubbly. Remove from the oven and allow pies to sit on the pan for 5 minutes. Remove and cool. Serve warm or at room temp. ~There are several apparitions of Our Lady in France, so these mini treats could be used several times around the year. 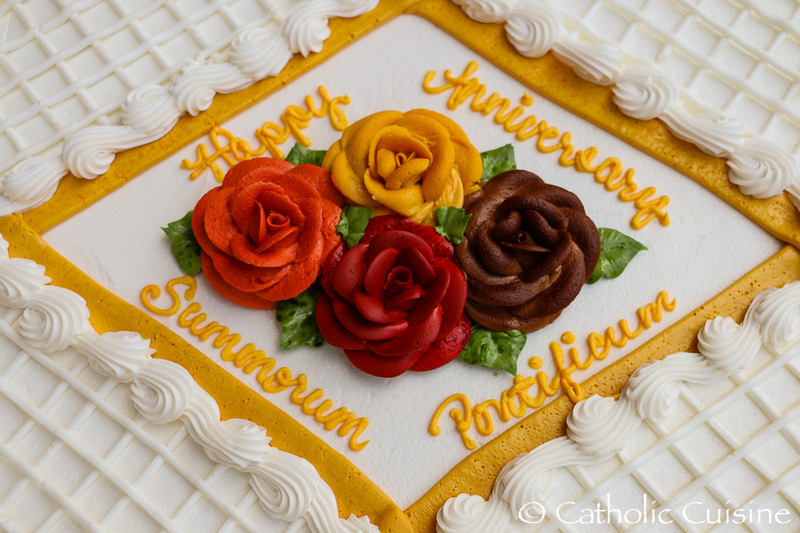 I didn't have an opportunity to decorate a cake this year (you can find last year's Deo Gratias Chant Cake here), but Costco kindly added some writing to one of their fall bouquet cakes for me yesterday! 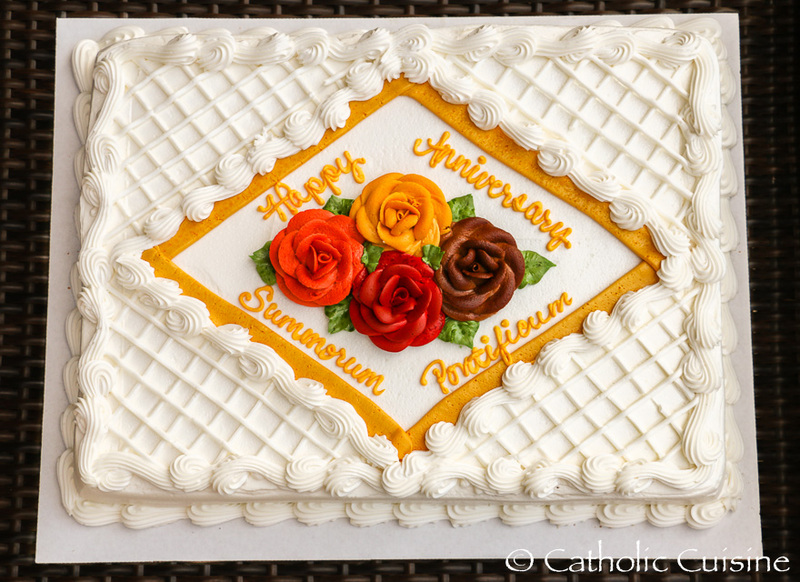 I'll be serving the cake following our local (once every other month) Extraordinary Form Latin Mass this afternoon, which happens to fall on the feast of the Exaltation of the Holy Cross and the anniversary of the implementation of Summorum Pontificum! New St. Michael Apron and Giveaway! Catholic Embroidery has generously offered to give one of their brand new St. Michael Embroidered Aprons to a visitor here at Catholic Cuisine, just in time for the upcoming feast of St. Michael on September 29th! 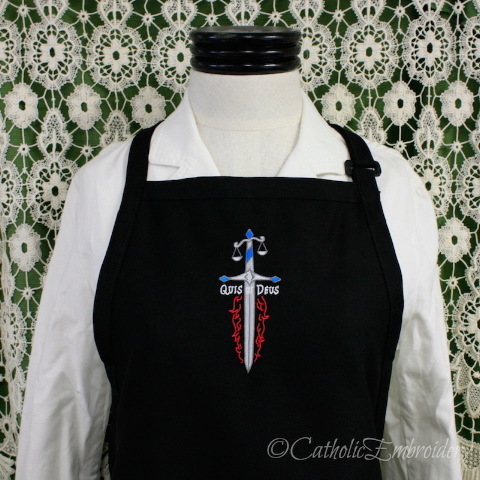 Black cotton twill apron featuring our St. Michael Sword design that includes the scales of justice, flames of St. Michael's battle, and famous quote, "Quis ut Deus" - Who is like unto God? This apron, and many more, can be purchased here at Catholic Cuisine (Catholic Cuisine will receive a percentage of any of the aprons purchased from this page), or they can be purchased directly from Catholic Embroidery! Enter STMICHAEL coupon code for free shipping on all orders over $45 through September 29th. Additional ideas for celebrating the feast of St. Michael can be found in the archives. Note: I'm also hosting giveaways each day this week over at Shower of Roses from September 1-7, 2014. You can find Our September Book Basket and Giveaway here and today's Holy Heroes Giveaway here. Be sure to stop by and enter!